Sunday, December 14th: Eat & Give Local For The Holidays! Chef Dustin Ronspies of Art of the Table during his 2011 Eat Local For Thanksgiving cooking demonstration at Ballard Farmers Market. Copyright Zachary D. Lyons. There are just two Sundays left before Solstice and Christmas, and only one before Chanukah to get your local on for the holidaze at your Ballard Farmers Market! And we’ve got everything you’ll need right here, from the greenery to decorate your door to the pie for dessert; from the wine and cider to muddle to the roast for your oven; from local salt to season your food to treats for Fido to gifts for under the tree, in the stocking or behind the couch. Make this holiday season a local one, and give a truly unique gift with a local face behind it. Heck, we’ve even got a chef to give you cooking tips on how to make it great! Yup, Chef Dustin Ronspies from Art of the Table joins us today for an Eat Local For The Holidays cooking demonstration today at 11 a.m.! Smoked hams for Easter from Skagit River Ranch at Ballard Farmers Market. Copyright 2014 by Zachary D. Lyons. Don’t forget the roast beast for your holiday table! Skagit River Ranch still has plenty of holiday hams available, and these beauties are delish! They’ll also have some pork rib roasts today, too. And plenty of sausage to working into your holiday dressing. Mixed kale from Alm Hill Gardens at Ballard Farmers Market. Copyright Zachary D. Lyons. The kale at Alm Hill Gardens (Growing Washington) came through our second early deep freeze surprising well, Clayton tells us. And keep in mind that the farm is within a stone’s throw of the Canadian border, where it takes the frosty outflow of the Fraser River Valley right in the teeth. And while it was warmer this past week, Clayton and the crew spent most of it battling high winds instead, repairing row tunnels and harvesting deliciousness, just to bring you the freshest local food. Show your appreciation by making this an Eat Local For The Holidays kinda year! Carrots from Kirsop Farm at Ballard Farmers Market. Copyright Zachary D. Lyons. Between freezes and floods, we’ve already seen quite a few farms leave your Ballard Farmers Market earlier than usual this fall. But the good news is that in the midst of all of this, we actually added another farm: Kirsop Farm from Tumwater! A veteran farm, they are new to us here at your Ballard Farmers Market in the last month. Their organic produce is as good as any in the state, like these carrots — crunchy and sweet. Image them buttered or roasted alongside your roast beast, sprinkled about your salad mix from Colinwood Farm, or simply as a vehicle for transporting some hummus from Uncle Eyal’s into your mouth! Huge Sweet Salmon & Sweet Meat winter squash from Nash’s Organic Produce at Ballard Farmers Market. Copyright Zachary D. Lyons. Devon tells me that Nash’s Organic Produce will be rocking the Nash’s red kale, Brussels sprouts, green and savoy cabbage, and more, all of which came through the freeze fine, as well as bringing back their famous root medley bags which make for easy root roasts and stews. And don’t forget their huge Sweet Salmon and Sweet Meat winter squash, too! Beef roasts from Olsen Farms at Ballard Farmers Market. Copyright Zachary D. Lyons. Speaking of roast beast, Olsen Farms will have freshly smoked holiday hams and beef and pork roasts, and leg of lamb, today and next Sunday. In fact, if there is a particular roast or size you desire, they’ll be cutting more this coming week, for you to pick up next Sunday. Stop by and talk to Allen and let him know what you want, and he’ll set it up for you. And don’t forget potatoes! D’Anjou pears from Booth Canyon Orchard at Ballard Farmers Market. Copyright Zachary D. Lyons. 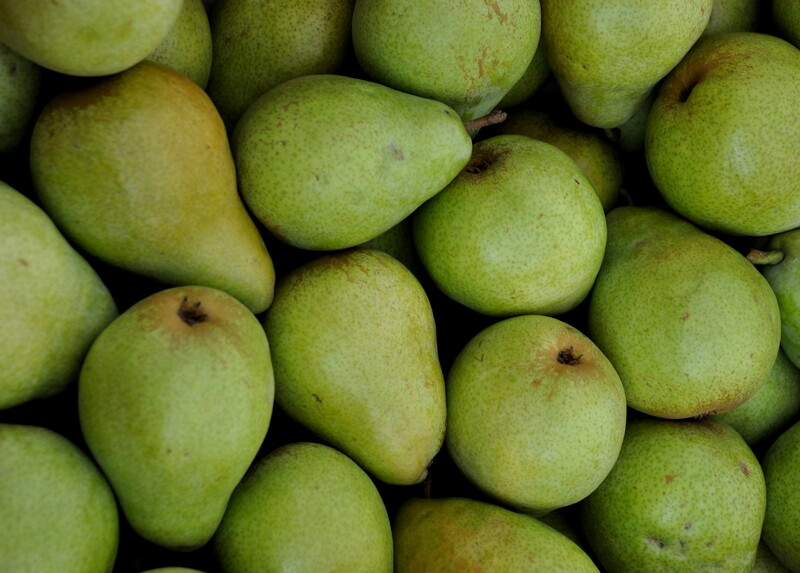 Booth Canyon Orchard still has lots of apples and pears, like the versatile keepers, these D’Anjou pears. They are a great eating pear, are great added to salads, and they are a wonderful cooking pear, too! Colorful skirts from Marmalade Originals at Ballard Farmers Market. Copyright Zachary D. Lyons. And don’t forget all the wonderful local artists who bring their handcrafted goods to you here at your Ballard Farmers Market this time of year. Like Marmalade Originals, which makes these beautiful, colorful skirts by hand. Anyone can buy a garment from a Big Box store with some corporate logo on it, made in a sweat shop in Bangladesh, so the recipient will look “different” by looking exactly like everyone else. Only you can invest in a truly unique piece of clothing artwork that will make your special someone stand out from the herd! Don’t forget to check out our midweek update for lots more info about this week’s offerings. And there is plenty more local deliciousness waiting for you today at your Ballard Farmers Market. Just check What’s Fresh Now! for a more complete accounting of what is in season right now.